In case of mild burns, cut the hair of the affected area and apply aerosol spray remedy or ointment of tannic-acid base. If you do not have either of these, make use of strong tea. This can be applied over the burned area through a gauze bandage tape. Apart from all these a 1% picric-acid solution, crude cod-liver oil or bicarbonate-of-soda solution can also be used. One must avoid using strong antiseptics such as iodine because this would cause more damage to the burns. The burns which are caused by acids and alkalis can be treated by washing the area with wash water many times. Burns caused due to alkalis can be normalized by a weak solution of vinegar or lemon juice. On the other hand burns caused due to acids can be normalized by ammonia or bicarbonate of soda. In case of severe burns; rush the dog to a veterinarian as soon as possible. 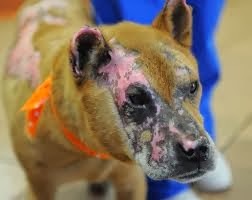 Handle the dog with caution in case of severe burns or scalds as the dog would be in terrible pain. Keep the dog warm by hot water bottles or an electric heating pad if he falls into a state of shock. At this stage it is necessary to make a dog comfortable and not apply remedies that will cause problems later on. You must avoid oils and greasy ointments and also don’t use cotton directly on the wounds. As in this case cotton would stick on the wound which is difficult to remove later on. You may use sterile gauze or a clean cloth soaked in bicarbonate of soda. Hurry the dog to a veterinarian after placing a blanket over him to keep him warm. The circulation can be judged by temperature. The lower the temperature, slow would be the circulation. Due to this very reason, it is important for you to keep the dog warm. Do not give stimulants to an unconscious dog as it can result in death. Try to resuscitate your dog with whiff of smelling salts or ammonia under his nose. Treat the dog for shock and carry him to a vet at the earliest possible hour.